The lawsuit centers on Daniels' assertion that a man approached her in 2011 in a Las Vegas parking lot and made a veiled threat after she agreed to talk about her alleged encounter with Trump to In Touch magazine. 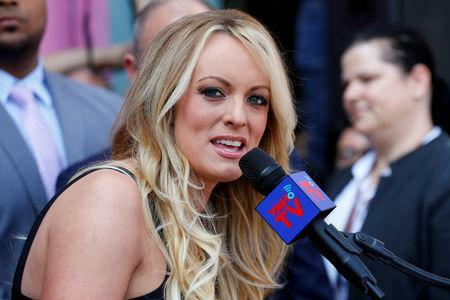 Soon after Daniels released a sketch of the man she said threatened her, Trump, who has denied having an affair with Daniels, disputed her account on Twitter, saying: "A sketch years later about a nonexistent man. A total con job, playing the Fake News Media for Fools (but they know it)!" Daniels' attorneys said the tweet portrayed her as a liar, but attorneys for Trump asked a federal judge in Los Angeles to dismiss the defamation lawsuit. "The question is whether the tweet by the president is protected communication or political hyperbole and non-defamatory on its face," U.S. District Judge James Otero said at a hearing on Monday. Otero cited certain protections from defamation Trump would have under the U.S. Constitution's guarantee of free-speech rights. "He's a public official, he's president of the United States, so it doesn't get much higher than that," Otero said. "It's free speech by a public official on a matter of public concern." The lawsuit was originally filed in New York but was transferred to Otero's court in Los Angeles because he is holding hearings on another lawsuit involving Daniels. Last month, Trump's longtime personal lawyer Michael Cohen pleaded guilty to violating federal election law by paying Daniels $130,000 not to disclose information harmful to Trump.